'Paper Girls Deluxe Edition' Vol. 1: The Horror News Network Review - Horror News Network - The Horror News You Need! In the history of comic books, there are some strange coincidences when it comes to timing. Probably two of the most famous examples are the initial similarities between The Doom Patrol and The X-Men and Swamp Thing and The Man-Thing. Both pairs were released very close to each other by DC and Marvel, and they bear more than a passing resemblance to each other, at least on a surface level. 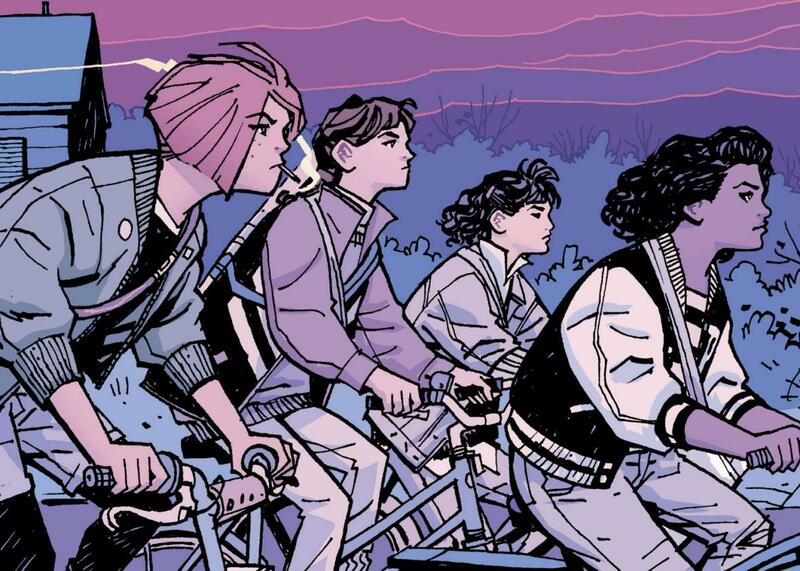 In a similar fashion, when it comes to Brian K. Vaughan and Cliff Chiang’s Image Comics series Paper Girls, comparisons to the Netflix darling Stranger Things are impossible to avoid. Although the first issue of Paper Girls debuted almost nine months before Stranger Things aired, new fans whose first introduction to the series through the trade paperbacks and the new hard cover deluxe edition are sure to see some similarities. Both series are set in the 1980’s, feature a crew of pre-teen and teenage protagonists, and ominous, unknown forces, but this is where the similarities end. 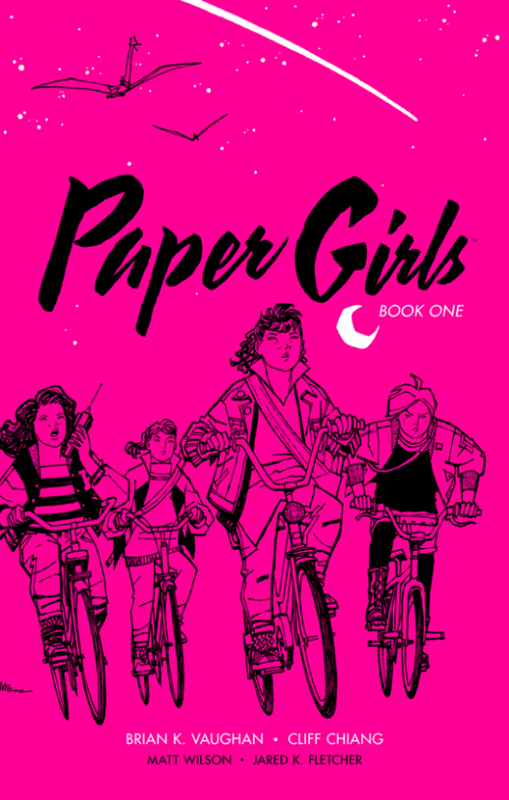 Fans of Stranger Things who are unfamiliar with Paper Girls may first find the series appealing due to the initial surface comparisons, but once fans enter the world of Paper Girls, they will be hard pressed to leave it. Brian K. Vaughan has been one of the most prolific and creative writers over the past twenty years, who along with his work for the “Big Two” on such household names as the X-Men and Batman, is known for his knack for creating atypical genre-bending stories such as Runaways, Y: The last Man, Ex Machina, and Saga. If you are familiar with any of his previous work, you know that you are going to get sharp, realistic dialogue, solid storytelling, and critical subtext and Paper Girls is no exception. 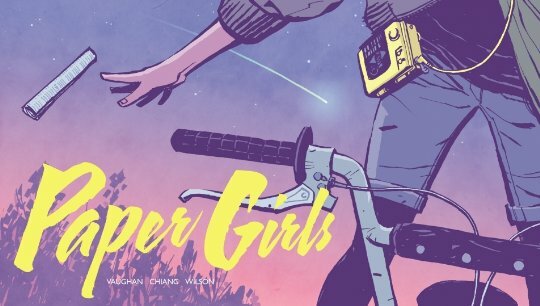 Paper Girls starts with a glimpse of Erin, a new girl in a small town who picks up one of the only jobs available to kids in the 80’s: delivering papers door-to-door. As everyone knows who had a paper route in this era, it was no easy job. However, having to deal with dogs, bullies, and deadbeat subscribers is just the tip of the iceberg for Erin, who luckily finds her own posse of fellow paper girls to go to for advice and protection in her new surroundings. What Erin does not expect to encounter on Halloween night however is a strange visitor from another dimension. Vaughan’s set-up quickly establishes the group and their personalities. Along with “new girl” Erin, the group consists of the “tough one” Mac, the “smart one” KJ, and “the sensible one” Tiffany (even the names have the 80’s vibe that Vaughan establishes in the series). The interactions between all four seem authentic to both the time period and their age group. While nostalgia for the 1980’s appears to be at an all time high, the characters are not idealized. They talk like kids have always talked to each other, with whip-smart sarcasm, insults, and four-letter words. This is one of the aspects that immediately grounds the story in reality, even though by the end of the first issue, it is clear that the reader is in for a healthy does of science fiction and horror. Writers that don’t take the time to establish their characters as “real” at the outset run the risk of the story devolving into parody or hack work, and Vaughan applies his patented formula to the four girls, clearly distinguishing them from each other and setting up further conflicts along the way. Chang’s art is the perfect compliment to Vaughan’s style. The artist brings an unexaggerated style to the characters, (which has always made his super hero artwork on titles such as Wonder Woman and Green Arrow appear so life-like) but when his subjects are everyday children, Chang’s style is perfectly suited for the material. And when it comes to visitors from another dimension or floating, futuristic Eye of the Beholders (from the AD&D Monster Manual), Chang is equally suited for the task. As Vaughan states in the supplementary materials in this edition, the writer quickly learned “…to get the hell out of the artist’s way” when it came to allowing the artist to create the visual world that the story takes place in. For instance, Chang establishes Erin and her sister’s relationship and the time period, with five panels and three words of Vaughan’s dialogue on the page. The disgruntled looks, Monster Squad and Depeche Mode posters, and a variety of toys does with one page what it would take other artist-writer combos to do over the course of an entire first issue. Chang is also adventurous with his use of a variety of page configurations. Some of the pages consist of multiple panels, some are splash pages, and others shift the view sideways, all making for an enjoyable and unique artistic presentation. Stay tuned to Horror News Network for more news and reviews and our annual Horror Comic Awards in late December.